This traditional Crisp can be make with any fruit. 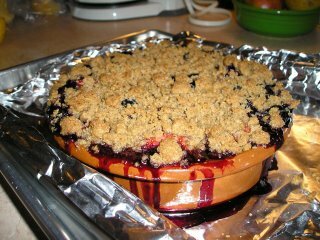 Here is it made with a mix of blueberries, strawberries and peaches. The magic of making of good crisp is in picking the right baking dish. It must be small enough that your fruit is raised high above the edge in a nice dome shape. During baking, the fruit will cook down and the juices will bubble up. If that crispy topping isn't raised high enough it will get softened by the juices. You can use any shallow baking dish for any amount of people. I've used a pie pan for a big crowd. But you must make sure you've got enough fruit to fill it up and over the edge. The recipe is from Fine Cooking #43 and it is wonderful. The topping can be made ahead and frozen so that any time you have the fruit you can produce this crisp on short notice. Fruit Crisp from Fine Cooking magazine issue 43. Combine the flour, sugars, salt, and cinnamon, if using, in a medium bowl. Rub in the butter with your fingertips, until it’s well combined and the mixture crumbles coarsely. Refrigerate until needed. Add thickener: In a small dish, dissolve 1 teaspoon to 1 tablespoon cornstarch in 1 tablespoon lemon juice. For juicier fruit, such as berries, use the greater amount of cornstarch. For denser fruit, like apples and pears, use the lesser amount. Pour over fruit. Add optional flavorings(1 of the following): 1-2 teaspoons grated lemon or orange zest, ½ teaspoon ground cinnamon, ½ teaspoons grated fresh ginger, 1 teaspoon vanilla extract, ½ teaspoon almond extract, dried cherries, cranberries, or raisins: ½ c soaked in hot water for 10 minutes and drained. Assemble. Pour the fruit into an 8 -9 inch square (or similar capacity) glass or ceramic baking dish. Set the pan on a baking sheet to catch overflow juice. Top the fruit with half the topping (refrigerate the rest) and bake for 20 minutes. It is one of my favorite desserts too, Helen. And it is one of the easiest, so it finds its way onto my table very often.